The areas between the boreholes are the “layers”. The Layers object in the cross section can use one scheme, and the logs can use another. The cross section layers always use a keyword scheme, but the logs can use another scheme type, depending on what type of logs they are. If your lithology information is in an interval table, then your cross section was created with zone bar logs, so your logs will also use a keyword scheme. If your lithology information is in a lithology table, then your cross section was created with lithology logs, so your logs will use a lithology keyword scheme. It looks like you were able to select Layers in the Object Manager and change the Keyword scheme in the Property Manager to change the scheme used by the layers. Now, you can change the scheme used by the logs. Select Logs in the Object Manager and change the scheme. 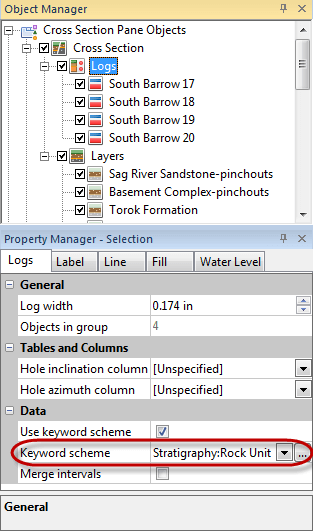 If the logs in the cross section are zone bar logs, each log will have this symbol next to it in the Object Manager. For this log type you can simply change the Keyword scheme for the Logs object to the same scheme used for the Layers. change the Keyword scheme used by all of the logs. Under the Keyword group, select the keyword scheme used by the Layers object. Click the Copy Scheme button at the bottom of the window. Select the copied scheme and click the Convert between Keyword Scheme and Lithology Scheme button , also at the bottom of the window. That will convert the copied keyword scheme to a lithology keyword scheme. Click OK in the Scheme Editor. Select Logs in the Object Manager and in the Property Manager set the Lithology scheme to the new lithology keyword scheme you created. Is there an easy way to automatically create a Strater scheme for all the entries in my keyword column?